Mobile Data Collection can collect lines and polygons in the field. In this tutorial, you can find instructions on how to set up a new line and polygon project, collect lines and polygons and how to review and edit the collected data. A single project can contain only one type of geometry, so it is necessary to create a separate project for lines and for polygons. Below you can find instructions on how to create a new, blank data collection project for both geometries. 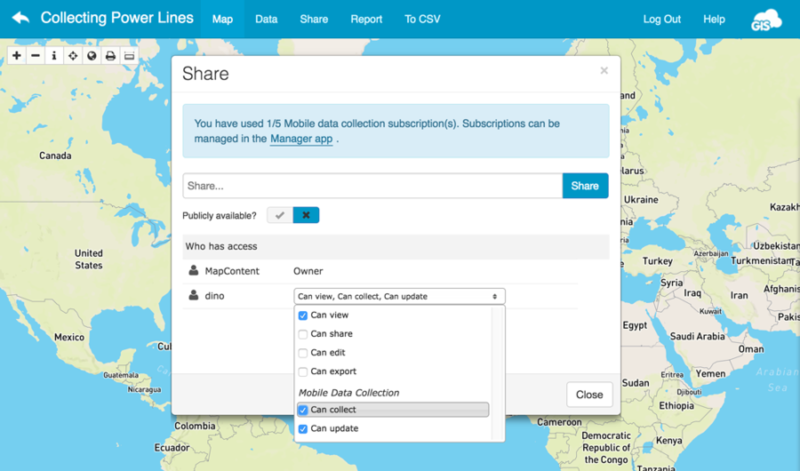 Open Mobile Data Collection Portal and log in with your GIS Cloud credentials. Define the project type: select Line to create a line collection project or polygon to create a polygon project from the select list on the left side of the form. Define the form fields: select the field from the drop-down list, add a name and additional options if necessary. Click Create project to save it. The project can be shared with the collectors with various permissions: Can view, Can edit, Can share, Can export and MDC permissions – Collect and Update. Note that the project needs to be shared with View and Collect and/or Update permissions in order to collect new data and update the existing data through MDC. More about sharing and permissions can be found here. Note: if you get an alert “You have 0/0 Mobile data collection subscription(s) in total available” then please check that MDC licenses are properly assigned in the Manager app. Here you can find info on how to assign MDC licenses. 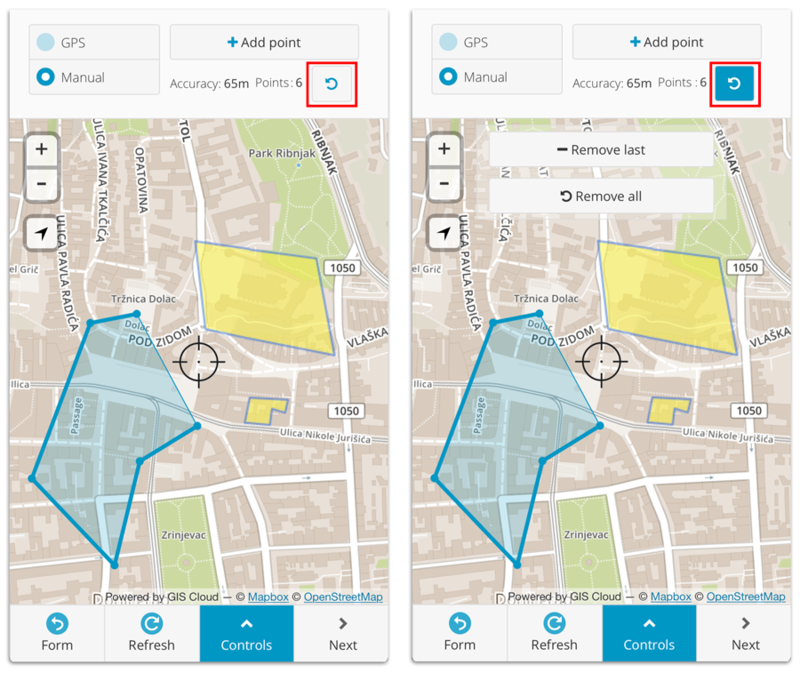 There are two ways to determine the location of the feature: GPS and manually by drawing the points on the map. Note: You can combine GPS collection and manual collection methods when collecting a line or polygon feature. 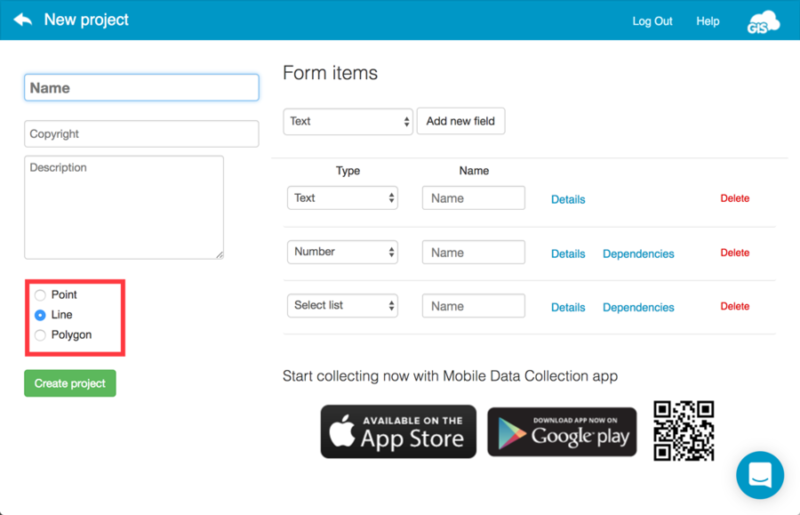 Log in to Mobile Data Collection on your mobile device. Navigate to Settings and open the project. MDC uses GPS location of the mobile device to determine the location, so it’s necessary to turn on GPS on the mobile device and enable location for MDC. In MDC on the mobile device, navigate to the form and click Start tracking button. The number of points and accuracy will display on the screen. The tracking can be paused and resumed if necessary. The form can be filled while tracking or when the tracking is finished. The lines and polygons can be drawn on the map as well. This method is usually used if GPS accuracy is not sufficient or a vertex of the line or polygon is not available. In MDC on the mobile device, navigate to the form and click Manual button. Click “Draw a Line” or “Draw a Polygon” to add a new point on the map. Note: you can remove the last added point or all collected points by clicking on the icon next to the points number indicator. The collected data remains in the queue if the mobile device until the Internet connection is reached. If the data can’t be sent, the error message will appear. Here you can find a full list of possible errors and tips on how to overcome them. 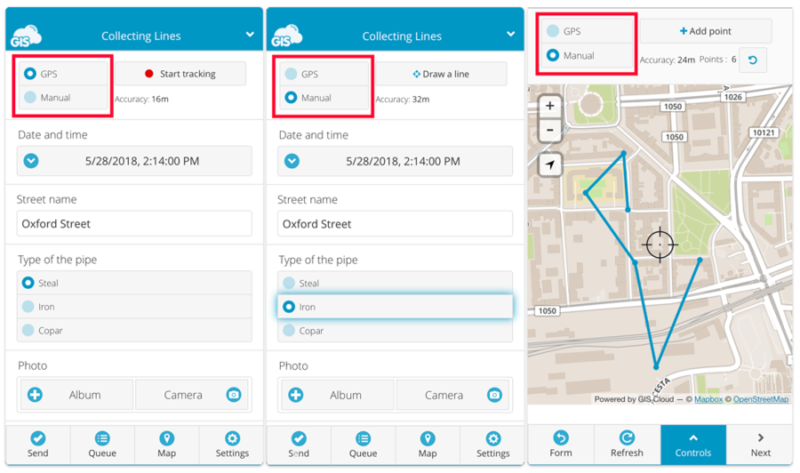 The collected data will appear as features on the map in the Map tab of MDC and web apps Map Editor and Mobile Data Collection Portal as soon as the mobile device reaches the Internet and the queue is emptied. In the map view in MDC, the data can be reviewed on the map or via search. Tap on the collected feature on the map to view its attributes. Read more detailed instructions on how to review the data here. In MDC both attributes and location can be changed. Select the feature on the map and tap Edit. You can remove the last added point or all collected points by clicking on the icon next to the points number indicator. When the feature is updated, tap Accept edit. The data will be updated as soon as the mobile device reaches the Internet and the data is sent from the queue.